As I think you are well aware of by now, I await your future moves with redbaited breath. Welcome back, the internets missed you. Like the Reverend, I’m looking forward to your posts and to seeing more of your exploration of the cartoon comics world. 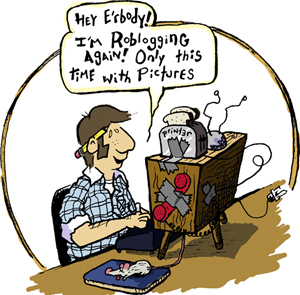 Roblogging with pictures sounds great. What’s up? I’ve hung around watching and reading for ages here. One acknowledges that men’s life seems to be very expensive, but different people require money for different things and not every person gets enough money. Hence to receive some loans or just credit loan would be a proper solution.